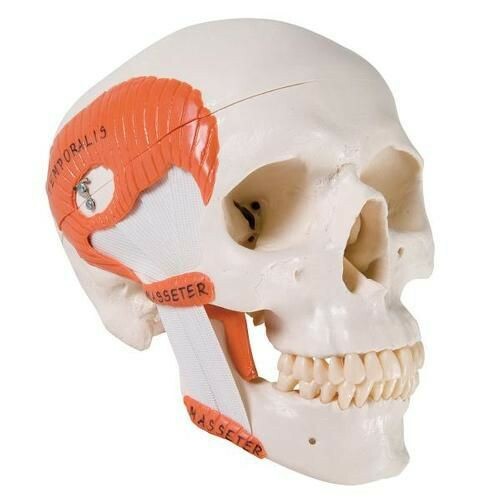 3B Scientific's TMJ Human Skull Model - A24 is a 2-part model that accurately depicts the anatomy of the masticatory muscles (lateral pterygoid muscles, medial, temporal, and masseter) with elastic bands. This high-quality skull model is durable and made from hard-unbreakable plastic. 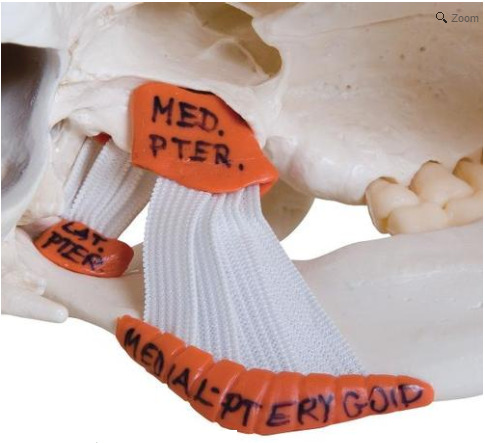 It is designed to help medical students and professionals understand the function of the masticator muscles with jaw occlusion, which is the muscle movement that allows the jaw to open and close. This model of the human skull is distinctive because it focuses on the anatomy of TMJ (temporomandibular joints). These joints surround the facial muscles and allow you to chew and move your jaw. This skull model weights 1.96 pounds, 9.1 x 6.6 x 6.6 inch in size, and is designed with a removable skullcap.